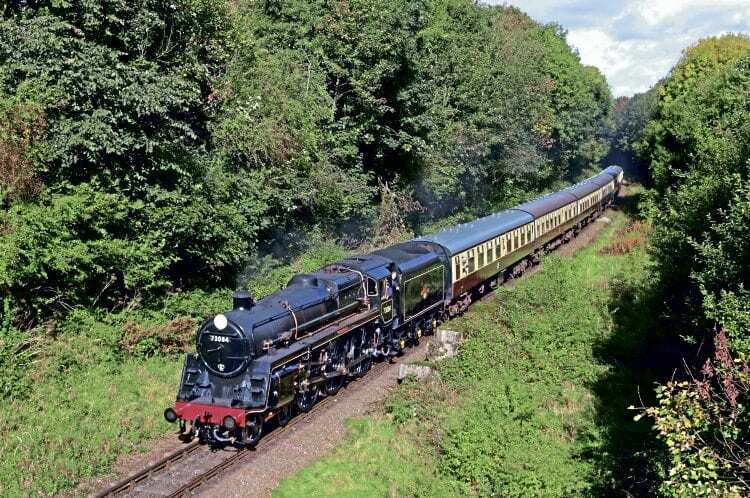 BULLEID Pacifics and a long-lost ‘Standard 5’ provided the main draw for the Great Central Railway’s (GCR) autumn steam gala on October 5-8. The event provided a final celebratory event in this 50th anniversary year that marked the end of Southern Region steam. The focus of attention was the pair of visiting Bulleid Light Pacifics that had been brought in for the event. Southern Locomotives Ltd’s ‘Battle of Britain’ No. 34053 Sir Keith Park was making its final visit away from the Severn Valley Railway before it departs for a new home at Swanage, while air-smoothed classmate No. 34081 92 Squadron appeared courtesy of the Battle of Britain Locomotive Society and the Nene Valley Railway. Unfortunately, the ‘Spam Can’ did not reach the railway in time to take part in Thursday’s timetable, but was cleared as fit to run for the Friday. BR ‘5MT’ 4-6-0 No. 73156 made its public debut at the event following restoration at Loughborough. In keeping with the Southern theme the locomotive had been given the identity of long-scrapped Nine Elms sister engine No. 73084 Tintagel, one of the so-called ‘Standard Arthurs’ that took their names from the Southern ‘King Arthur’ class upon their withdrawal.